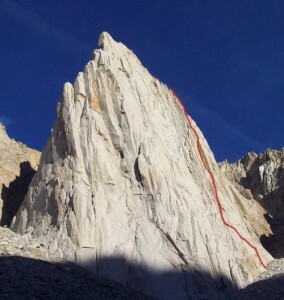 The Red Dihedral is probably the best 5.10 route in the High Sierra. It is the most moderate classic route on the Incredible Hulk but is still sustained and challenging (only one pitch is easier than 5.8). The rock is perfect, clean, golden granite and unlike most Sierra climbs, the route requires a fair amount of straight-in jamming technique (all the cruxes are on crack, not face). This is one of those few peaks that is much larger than it looks. From the base and approach, the upper pitches are not visible so when you get up on the climb it keeps going and going and going. Which SuperTopo guidebooks include a topo for Red Dihedral?